While our website is about German American and Latin American residents interned during WW II, we are making an exception to post Hisao Inouye’s memoirs here. He was held in temporary facilities, a military prison, and various Immigration and Naturalization camps, six in all, during his years as an enemy alien. While many of his experiences were common to all internee populations—dread of arrest when WW II began, transport from prison camp to prison camp, and worry about family left behind—he was a particularly observant man. He offers descriptions of the places he lived and visited, interactions with fellow internees, and insight into hearing procedures at the camp in Bismarck, N.D. Often assigned spokesman for his group because of his command of English, he had more opportunities to interact with camp officials than most internees. Born in Japan in 1908, Hisao Inouye and his family immigrated to Los Angeles, California, when he was a child. Educated in the U.S., he worked in San Francisco for S. Ishimitsu Co., a wholesale Japanese food and general merchandise import company, until 1932 when his firm transferred him back to Japan. 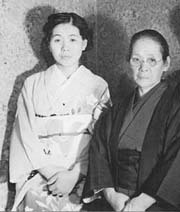 There he was drafted into the Imperial Japanese Army for two years, and in 1936 he married Aiko Toyomura. The company sent the couple back to San Francisco in 1937, where Hisao became branch manager. He was arrested and interned as an enemy alien in 1942. 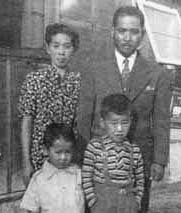 While he was moved from internment site to internment site, his mother, Kane, wife, Aiko, and sons, Akio and Tsuneo, faced the daunting prospect of life without him. Later that same year they were taken from their home and housed in horse stables at the Tanforan Race Track in San Bruno for several months, before being sent to a War Relocation Authority Camp in Topaz, Utah. The family was finally reunited in 1944 at Crystal City, Texas. 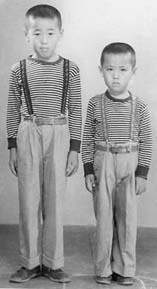 In 1972, at the urging of his oldest son, Akio, he wrote a memoir of his experiences in the United States before, during, and after World War II. We post it here courtesy of his son. The section entitled “The World War Period (1941/1946)” begins on page two of the PDF that follows. He occasionally used a Japanese word, listed below with translation. To read the memoirs, click here. Niseis—first generation born in the U.S.